Visit BeACentraNurse.com to schedule a time for our recruiter to call you! A representative will be onsite to answer your questions and provide a facility tour. 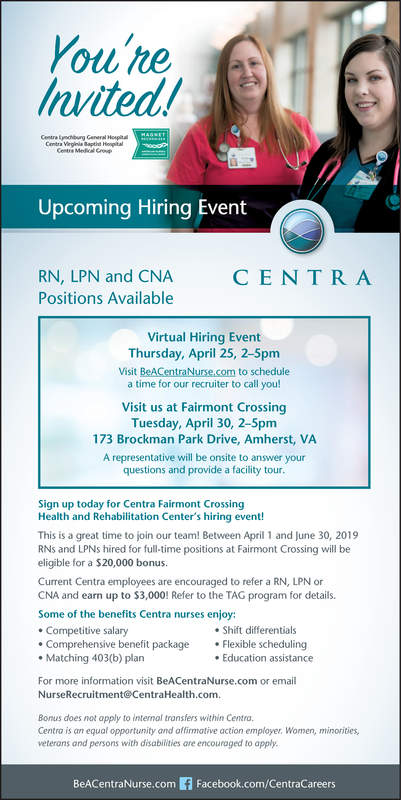 Sign up today for Centra Fairmont Crossing Health and Rehabilitation Center’s hiring event! This is a great time to join our team! Between April 1 and June 30, 2019 RNs and LPNs hired for full-time positions at Fairmont Crossing will be eligible for a $20,000 bonus. Current Centra employees are encouraged to refer a RN, LPN or CNA and earn up to $3,000! Refer to the TAG program for details. Bonus does not apply to internal transfers within Centra. Centra is an equal opportunity and affirmative action employer. Women, minorities, veterans and persons with disabilities are encouraged to apply.